European Union officials are considering a dual certification system so that goods produced in Northern Ireland will be able to circulate freely in both the EU and UK markets, RTÉ News understands. Another proposal is that goods moving from Britain to Northern Ireland could be checked at Dublin Port for EU customs and regulatory compliance before continuing on northwards, as a way of limiting checks and controls at British ports. Both ideas are among a range of possibilities that the EU Task Force is considering as part of the ongoing effort to "de-dramatise" the backstop. 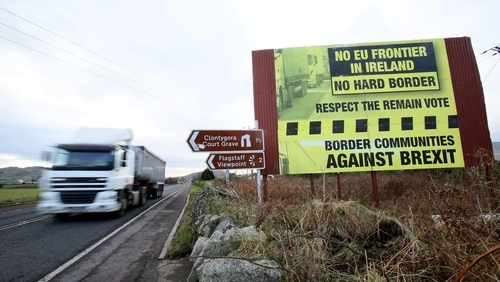 If the Irish backstop to avoid a hard border on the island of Ireland comes into effect, then customs and regulatory checks would have to be carried out on goods moving from Britain to Northern Ireland, because those goods would then be able to circulate freely throughout the EU’s single market, due to the lack of land border. Sources close to the negotiations have confirmed that Task Force officials have been exploring such ideas as they redraft the Irish Protocol within the Withdrawal Agreement. Under a dual certification scheme, goods produced in Northern Ireland would be deemed compliant with both EU and UK standards, so that they could move freely through the island of Ireland and beyond to the single market, and throughout the UK. The scheme could be implemented by private operators and would be similar to the CE marking that affirms that goods circulating throughout the European Economic Area comply with high safety, health and environmental protection standards. Under the backstop, Northern Ireland would remain within the single market for goods, so manufacturers there would be complying with EU standards. A dual system that makes the products certified for both EU and UK markets would, according to sources, help draw the political tension out of the backstop. Another suggestion is that goods moving between Britain and Northern Ireland could undergo regulatory and customs checks in Dublin Port before travelling onwards to the North. The Government believes that up to 60% of goods consignments moving from the UK to Northern Ireland, and vice versa, go through Dublin. If customs and regulatory checks were carried out there, it would further erode the notion of a border between UK and Northern Ireland, according to sources. Officials point out that Dublin Port will be undergoing infrastructural changes anyway in order to anticipate a possible future Free Trade Agreement between the EU and UK, in which case checks would be needed on goods moving from the UK to Ireland. "What de-dramatisation tries to do is to recognise the nature and type of trade that happens between GB and NI, and to find ways of minimising any checks and controls that would need to be put on that trade," says one source familiar with the negotiations. It is understood Irish officials have worked closely on the redrafted text. In a speech to the European Parliament this week, the EU’s chief negotiator Michel Barnier spelled out further de-dramatisation proposals. These would include using existing customs transit procedures to avoid doing checks at a physical border point on goods moving between the UK and Northern Ireland. Companies in the rest of the UK could fill in their customs declarations online and in advance when shipping to Northern Ireland. "The only visible systematic checks between Northern Ireland and the rest of the UK would involve scanning barcodes on lorries or containers, which could be done on ferries or in transit ports," he said. This latter idea suggests that Dublin Port is one of the transit points in mind. A dual certification scheme is also seen as a way of winning Northern Irish businesses over to the backstop. Mr Barnier told the European Parliament: "Our proposal gives Northern Ireland benefits that no part of a third country enjoys. In particular, continued access to the single market for goods, and continued benefits from EU free trade agreements." However, the DUP remains adamant that they will not support any new or additional checks beyond what already exists, or anything that puts Northern Ireland on a different footing from the rest of the UK. EU and UK negotiators are continuing intensive negotiations in Brussels on the Irish backstop issue ahead of next week’s EU summit. Officials are expected to work through the weekend, with a critical stock taking on Monday. The UK is expected to insist that any backstop for customs rules should apply to the UK as a whole, so as to avoid the need for customs controls on goods going to Northern Ireland. The EU is understood to be considering the idea, but with serious reservations about its legal basis, and the duration of such a UK-wide backstop. Both Dublin and Brussels have insisted that the backstop be "all-weather".